Andy’s friend John Kricfalusi asked him if he knew any talented voice actors. 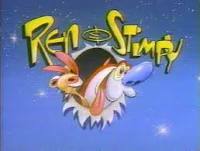 Andy suggested Billy West, who ended up as the voice of Stimpy playing to John’s Ren. At the same time, John asked Andy to create songs and score for his groundbreaking cartoon. Songs include “Don’t Whiz on the Electric Fence,” “Sugar Sod Pops” and others. Andy and John wrote a Ren and Stimpy Christmas musical special which sadly never saw the light of day as John was asked by Nickelodeon to leave the cartoon he had created.